Coke is one of the biggest brands in the world, widely recognised everywhere from Alaska to Zambia, with enormous global sales so why would they partner with The O2? For Coke it was never going to be about brand recognition or indeed huge sales volumes their partnership with AEG and The O2 centered around two key principles. Firstly association with organisations who are the “best in class”, The O2 is certainly that when it comes to entertainment and secondly Coke wanted to use this sponsorship as a vehicle to bring the brand to life and this was key when we did the deal. An added bonus came in the form of the happiness principle – that is people arrive to the worlds most popular music venue with a big smile on the face, a brand simply needs to understand how to tap into this, this is where the partnership team at AEG come in. The Flirt machine was a great example of this: To celebrate 20 of the Diet Coke hunk, hidden inside a seemingly regular vending machine was a gorgeous real live hunk. The more you flirted the more likely you were to receive a gift from the hunk. This unique activation was set KPIs relating to both the brand and the coverage. Post event evaluation showed it was hugely successful being covered in both print and online media using fashion titles and influential bloggers the video received over 300,000 views on social media and the reach of the campaign was estimated at 8million. Every brand and campaign KPI was surpassed ! 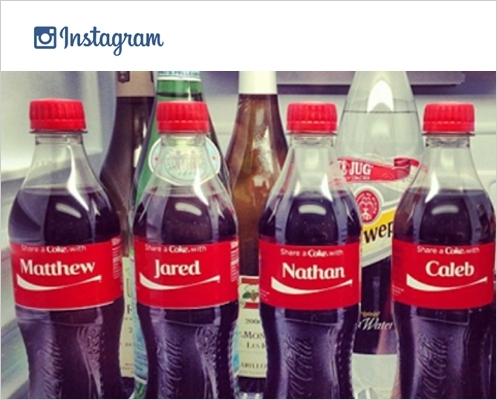 As part of the “Share a Coke” personalised bottles campaign, Coke provided personalised bottles to the members of Kings of Leon with unexpected results.